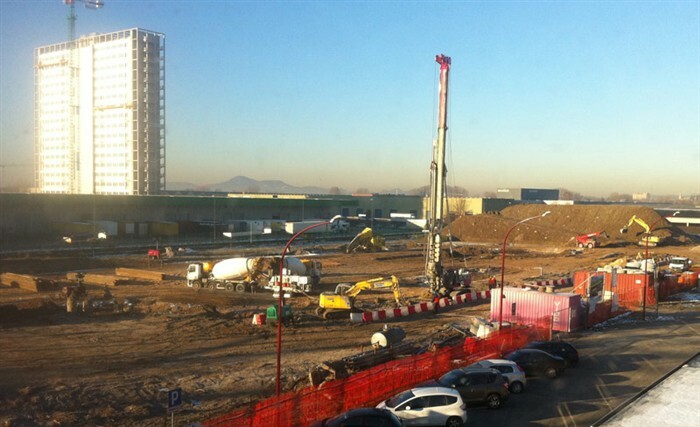 Progress on the NBTF site: The construction of buildings is moving ahead. A great deal of progress has been made for the establishment of the Neutral Beam Test Facility (NBTF) hosted by Consorzio-RFX in Padova, Italy. During the autumn, F4E awarded several procurement contracts allowing for manufacturing of necessary components to move full-speed ahead. The Neutral Beam Injection System is one of the main F4E contributions to ITER. It is composed of two Neutral Beam (NB) injectors, essential to reach the high temperature necessary for fusion reactions to occur in the plasma. The Neutral Beam Test Facility will host the prototypes of the ITER Neutral Beam Injector, which will be tested and developed there. The NBTF will host two independent test beds, namely SPIDER (Source for Production of Ion of Deuterium Extracted from Radio Frequency plasma) where the first full-scale ITER ion source will be tested and developed with an acceleration voltage up to 100 kV; and MITICA (Megavolt ITER Injector & Concept Advancement) which will be the first 1:1 full ITER injector aiming at operating up to the full acceleration voltage of 1 MV and a full power (16.5 MW). In total, three contracts have been signed during the past few months and the signing of the contract for the SPIDER Beam Source and Vacuum Vessel, worth around seven and a half million EUR, marks an especially important step as it is these components that make up the heart of the SPIDER experiment. Involving highly demanding technologies which necessitate complex assembly and tight tolerances, i.e. very exact measurements with only a small margin of error, the SPIDER Beam Source will be the first ITER full-scale ion source built in the world. The contract has been awarded to a European consortium consisting of French company Thales, German company Galvano-T and Italian companies CECOM and Zanon. A further milestone is the signature of contract for the NBTF Cooling Plant system for which manufacturing is starting on the components that will evacuate the 70 MW of heat from the SPIDER and MITICA test beds. The contract, worth eight million EUR, has been awarded to Italian company, Delta-ti Impianti S.p.A. The contract concerning the PRIMA Vacuum and Gas Injection Plant, worth about two and a half million EUR, has been awarded to Italian company Angelantoni Test Technologies. The contract covers the design and construction of the gas injection and vacuum plant systems which are vital for operation: the gas injector will provide the deuterium and hydrogen gas needed for the operation of the plasma, while the vacuum system will pump and therefore deter the gas from spreading and hindering the functioning of other parts of the plant where very good vacuum conditions are required. With the contract for the SPIDER High Voltage Deck and Transmission Line now in an advanced stage of its tendering and awarding procedure, the set of the main European industrial contracts for the construction of SPIDER is being completed. From 2013 onwards, the remaining European contracts for MITICA will be awarded. In addition, the NBTF is also moving forward in a very concrete way, namely through construction: the NBTF building is currently being built. The works, which are funded by Italy in its capacity of Host State for the NBTF, include the construction of the halls which will host the MITICA and SPIDER experiments. The works are scheduled to be concluded by 2014, although the installation of some of the sub-systems will be possible starting from September 2013.